Microsoft is (finally) taking the input of its user more seriously, and not just their large enterprise customers (where the lead IS contact was the input person) and the MVP teams. This is for their entire user base! Microsoft has partnered with an external company to “engage with customers about new features and ideas.” UserVoice is something I am very excited about. Goal is to gather end user input (that’s you and me!) on features we see as needed in an Office app. Microsoft, from what I have been told, is going to have this data be a factor in determining what they need to focus on. Vote for the ideas you like. This is a big part of the data that Microsoft will be receiving – “how many people agree with this being a needed feature?” NOTE: Each user only gets 10 votes! UserVoice is not a forum for tech support. Its purpose is hearing what people want to see. This is great for me to see as Microsoft continues to move toward a constant app evolution and roll out of new and improved features vs. new version every 2+ years. All the way in 2006, I posted about computer specs and my recommendations (read it here). 9 years later, those specs are comical by today’s standards. Of the 20+ computers here, not one is in line with those dated specifications – none are that wimpy. I need to also highlight that the computer specs are only 1 part of the solution, and they are the easy part. The other part of having a full graphics computer is setup and software. We invest hours into setting up every computer and even more time into the almost continuous process of configuring new updates, drivers, software and settings. Will this be my recommendations next year, or in 5 years? Doubtful. I am already holding off purchasing additional computers while waiting for USB-C, wider (Windows) adoption of Thunderbolt data, new generation of CPUs and more. Presentations are the creation of many people copy/pasting content into a single slide deck. One of the common content edits is double spaces in sentences. Here is a quick and easy method for removing them. 1. On the Home ribbon, select “Replace” on the far right. 3. PPT will find all instances of double spaces and replace with a single space with 1 click! It searches the Notes section as well as slides, but it’s certainly very helpful in catching the ones hiding in slide content. 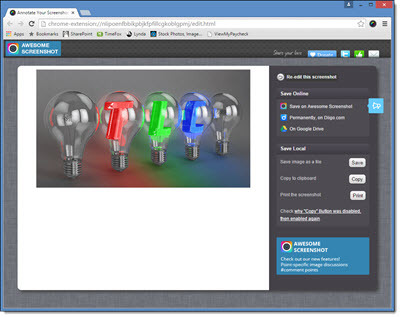 All of the designers at TLC use Snagit for screen shot needs; it is installed on every computer we have. Windows and Mac OS both have built in screen capture options that are cute and nice, but not robust. 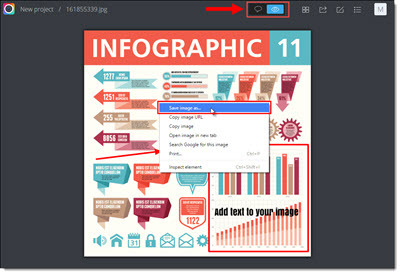 We recently found Awesome Screenshot.com which is a great online screen share, and edit app, something we can use when working on a guest computer. Awesome Screenshot is free for 30 images and 1 project folder. The premium option (currently $8.99 promo, regularly $11.99 year) has unlimited image captures and project folders. 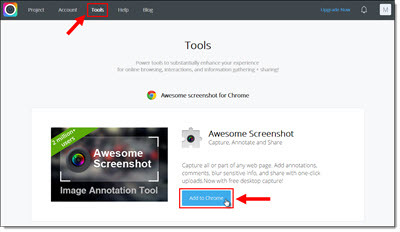 The Chrome browser is the only one that supports the add-in, but the annotation and editing features can be used on any browser. The Chrome add-in makes Awesome Screenshot a more full featured option (eg. Use Chrome for this app). 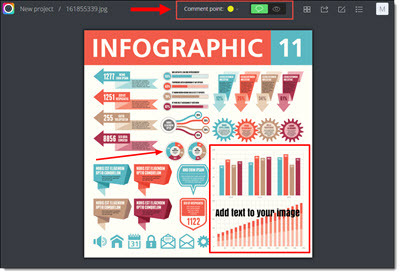 Possibly one of the coolest features of Awesome Screenshot is adding comments to screenshots (much of what we use SnagIt for) and sharing directly from the site. In addition, other users are able to comment on the screenshot image as well, so this can make collaborative feedback simpler than ever! 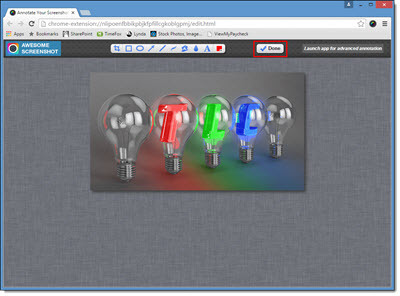 Some other cool tools are highlighting or blurring text. But the editing tools are more limited than other apps with fewer less colors, shapes, etc. Still, the ability to organize the screenshots by project is unique and pretty awesome (pun intended)! Use Chrome and create an account. Under the Tools tab, select Add to Chrome, and follow the steps to install. After installed, Chrome has this app icon. 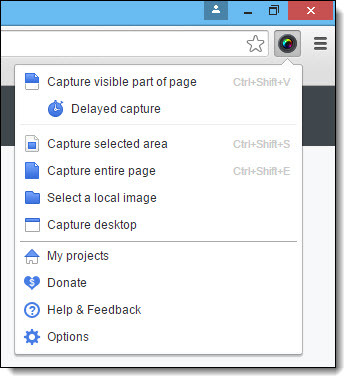 Click the Awesome Screenshot icon to view capture options. In addition, you can drag and drop existing images into the open project folder of your choice or select “Add images” from the project folder page on the website. Capture a screenshot (all or part of the screen) and it shows up in the simplified Annotation (or edit) screen. Save the image to a project folder to get to the full editing options. There are several save options – save online for best collaboration. 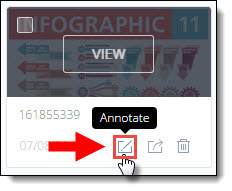 To edit, click the Annotation icon while hovering over the image. The top bar is the editing tools: Crop, draw, shapes (rectangle or oval), arrows/lines, text, blur, color, line weight, undo, redo, reset, delete shape, and zoom. Save edits and add comments. By default, it goes to the comments page. You can also select other images in the project folder, share the image, return to the Annotation page, or view the comments list. 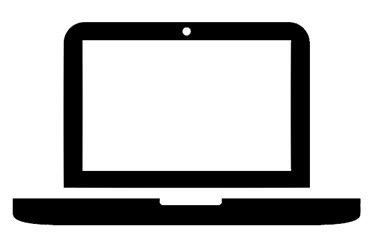 Click the “eye” icon to exit the page, or right-click select Save image as to get a local version of the image on your computer – which can be added to a presentation. Thanks to staff designer Michelle for this review. 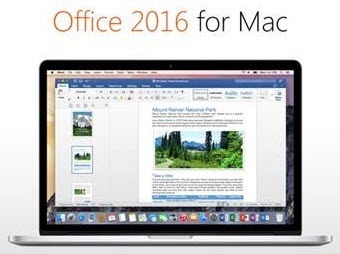 Office 2016 for Mac – Available! Office for Mac 2011, the current version, has been in existence for 4.5 years. That is a very long time between upgrades. But Microsoft has (finally) released Office 2016 for Mac – and it is a very good upgrade. If you are an Office 365 subscriber, Office 2016 for Mac is part of the subscription and an easy upgrade. If you are a retail or corporate licensing client, you may have a few months until Microsoft has it available to you. I have been fortunate to be running the beta version for the past few months and have found Office 2016 has good parity with Office 2013 for Windows (not perfect, but much, much better). The interface uses the Ribbon styling (although not all buttons and options are in the same place or available) and the functionality is near identical. The ability to move presentations between platforms has never been better (again, not perfect, but a huge step forward). This is a major undertaking by the Microsoft Mac Office team (completely coding a new version of Office) and I expect Office 365 subscribers to have a steady stream of refinements rolled out (which is great!). For TLC Creative Services’ design projects, we have multiple stock asset subscriptions for images, video, music, etc. I recently noticed Adobe has a new stock image option called “Adobe Stock.” Being an Adobe Creative Cloud subscriber, I was excited that this may be a new CC benefit – which it is, and is not. Adobe Stock is a new service that offers royalty-free, high quality photos and graphics. 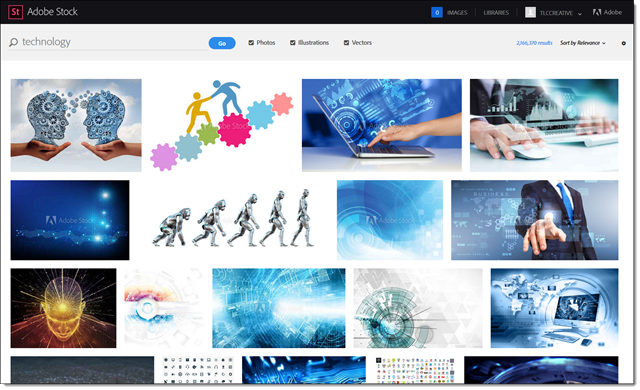 Currently Adobe lists a library of 40 million “world-class, curated images and graphics.” The image selection is very high quality, but many images are the same (or very close) to those found on other services (which is not necessarily bad). I was hoping to find it an included option with Creative Cloud subscription (wishful thinking), which it is not (reality). It is a separate paid service that can be added to a Creative Cloud subscription. One interesting difference from other services is there is only one size available, BIG. File formats are .jpg or .eps. The other big differentiator from other services is images can be managed directly from Photoshop, Illustrator, and InDesign using Libraries. Watermarked preview images are saved directly to your Adobe CC account’s library as they are added to work. If you decide to purchase, it can done directly inside the app AND the watermarked images are automatically updated to the high res, non-watermark version (which is a pretty fantastic feature!). $30 monthly for 10 images. Unused images will rollover for up to 120 images. Additional images cost just $2.99 each. The other plan available is $200 a month for 750 images. Will we be adding Adobe Stock to TLC Creative Services’ options? Not immediately. The cost (for the 750 images per month) is competitive with what we are currently using. When subscription services are up for renewal, Adobe Stock will definitely be one of the options to consider. 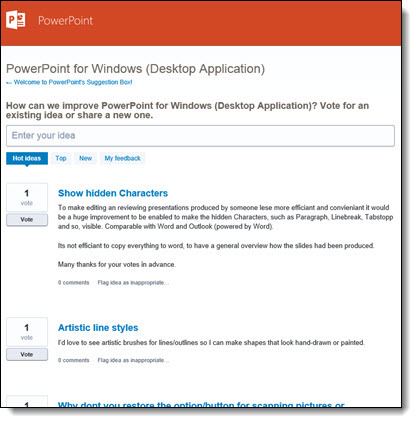 “PowerPoint Documents” is our internal term for using PowerPoint as the design tool for print/PDF documents. These do not use slide transitions, animations, or other “presentation” features. 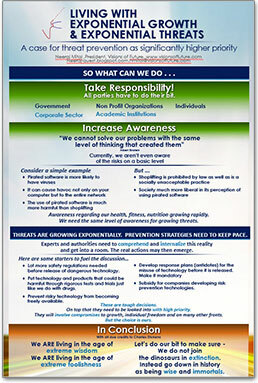 This example is a part of previous post project (sync’ing narration to animated slides), where in addition to the presentation design we developed a 24″x36″ poster that visually coordinated with the presentation design. Note: Typically we would design this in Adobe InDesign for assure print quality, full bleed design, etc. The request was to develop in a PowerPoint so edits could be completed by the client for each talk. We setup with a custom page size, optimized the graphics for the larger slide size, added the requested content. 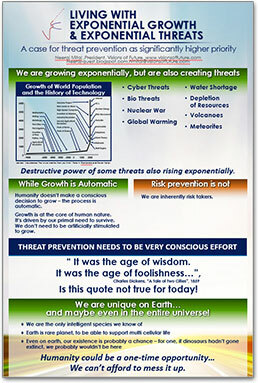 The end deliverable was the 2 posters, 2 slides in a PowerPoint document. The client was able to revise content, create PDFs to send out or print (and we included print quality specifications regarding PDF from PowerPoint resolution). With audio being so easy to embed into PowerPoint, we are having many clients request we create a version of the presentation with their talk embedded into the slides. PowerPoint does have audio recording features, but we opt for pre-recorded audio that is recorded distraction free of the slides, higher audio quality and we can edit in an audio editing program. We also develop 1 audio file per slide (if a client provides one audio file for the entire presentation we chop it into multiple files using Adobe Audition, or directly in PowerPoint by trimming the file to each slide needs). For this specific project, we were provided individual audio clips for each slide. We sync’d the animations to the audio narration, which is a great end result, but a tedious process of listening and re-listening to the entire audio file while adjusting the animation timing to get everything perfect (an animation timeline feature I would really like to see the Microsoft PowerPoint team update!). Slide transitions and all animations were set to automatic. 1. 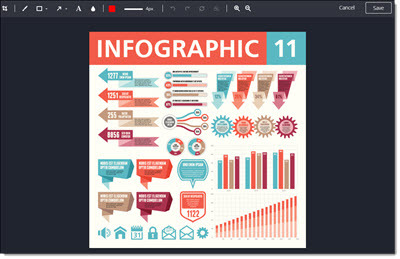 Editable PowerPoint, with on-click animation and transitions. 2. 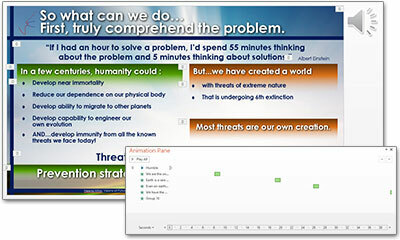 Editable PowerPoint presentation with audio narration embedded and animations & transitions set to auto. 3. 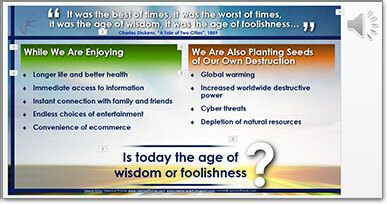 A video version of the presentation (exported direct from PowerPoint). To everyone in the U.S.A. – Happy 4th of July! Here is a full featured Americana themed PowerPoint template (designed by staff designer: Cara), that features animated fireworks layouts. This template is free for all to download and use!